Saturday 3rd September 10am to 4pm. HADAS Open Day. Hendon Baptist Church Hall, Finchley Lane, Hendon NW4 1DJ. Display of artefacts from Hendon sites & a series of brief snapshots of life in Hendon. FREE including refreshments. Monday 19th to Friday 23rd September: Trip to Bradford-on-Avon. Tuesday 11th October @ 8pm: Women in Medieval London. Lecture by Professor Caroline Barron. Tuesday 8th November @ 8pm: The Cheapside Hoard. Lecture by Hazel Forsyth. Tuesday 10th January @ 8pm: My Uncle, the Battle of Britain VC. Lecture by James Nicolson. Tuesday 14th February @ 8pm: To be confirmed. Tuesday 14th March @ 8pm: Bugging the Nazis in WW2: Trent Park's Secret History. Lecture by Helen Fry. As part of my Masters in Archaeological Practice at Birkbeck College, I am examining what life was like in the Mesolithic past in North London based on evidence collected by HADAS members and stored in the LAARC – London Archaeological Archive and Research Centre. Around 11,000 years ago, people lived on the high ground at West Heath, Hampstead, hunting red deer, living off other forest resources such as hazelnuts, hunting or cohabitating with beavers, and eating the occasional odd swan. 1989. Much of the analysis was based on spatial patterning and tool typology. I’m working through this analysis of lithic tools to see if there is evidence for duration of occupation and comparing postholes found there with similar finds at Howick, Northumbria, and Star Carr, Yorkshire, where dwellings have been interpreted and reconstructed experimentally, as well as faunal evidence at Three Ways Wharf, on the River Colne, where red deer, swan and beaver were found. At that time the Thames was a tributary of the Rhine and the southern North Sea was land where people lived. We know about these people mainly from the stone tools they made, including micro-lithic tools, serrated edges, and axes - these and other tools point not only to hunting but also working skins (scrapers), tailoring by sewing skins together (piercers), wood and bone working (burin, axes, serrates and saws) as well as hafting pointing toward use of twine/adhesive. We term these people as Mesolithic based on micro-lithic and axe technology and relationship with the Boreal/Atlantic forest – a period that lasted more than 4,000 years. West Heath can be dated to this early period when birch forest was being replaced by hazel and oak. Work by Bryony Coles in France on beavers’ re-colonisation suggests how we can consider beavers during the Mesolithic in Britain making the environment desirable by building dams in places such as West Heath – holding nutrients on higher ground, attracting water fowl, fish, as well as grazing animals (red deer) and their predators such as wolf and people. Recent publications add to the picture of Mesolithic wood-working; bone and wood was mainly lost at West Heath due to the acidic soil. Through strontium isotope analysis (- Langford, Essex - first time used on human remains from this period in Britain, published earlier this year in the Mesolithic Miscellany, June 2016) it seems to show people are more attached to place and spend their life on limited geology. The people of West Heath are likely to be highly mobile though the lithic scatters relate to postholes in plan and depth suggests people were here over a long period in two or three phases. Over 61,000 lithic items were found at West Heath, including over 800 identified tools. I’m only using a small sample to investigate this aspect in three trenches (still more than 2,000 lithic artefacts), learning about people who lived locally 11,000 years ago from evidence collected 40 years ago. S Maroo and DW Yalden 2000, The Mesolithic mammal fauna of Britain, Mammal Review 30, 243– 248. The following gives an eye-witness account of this aspect of London, in the form of Jacob's Island, a rookery situated straddling the Thames at Bermondsey, just east of St.
Saviour's Dock / The River Neckinger. It was Fagin's Den in Oliver Twist, with Sikes & Nancy. Chapter 50: "inhabitants on either side lower from their back doors & windows, buckets, pails, domestic utensils of all kinds, in which to haul the water up .... & when the eye is turned from these operations to the houses themselves, utmost astonishment will be excited from the scene before him. Crazy wood galleries common to backs of half-a-dozen houses, with holes from which to look upon the slime beneath; windows, broken & patched ....... Chambers thrusting out above the mud, & threatening to fall into it, as some have before ......"
Mayhew's London Characters (information gathered in 1867) describes it as a pest-nest: “against the posts of the bridges, were swollen carcases of dead animals ready to burst. At the back of every house were pig-sties.... One of the inmates replied " Neither I nor my children know what health is". If another inmate put his hand against the wall behind him, it would be covered by the soil of his neighbours privy, sopping through the wall .... Its inhabitants were wont to leave the murky hauled liquid to stand, so that they might after it had been left to settle for a day or two skim the fluid from the solid particles of filth & pollution which constituted the sediment.....Each epidemic of: typhoid, cholera, typhus, influenza, & scarletina came back summer after summer." These dwellings were rented. It might be a surprise that these conditions persisted even after the introduction of clean piped water & sewers legislation, but that didn't apply to the poorest! This was a fascinating and well-illustrated talk by the editor of Current Archaeology who has a long-standing interest in, and enthusiasm for, the study of Hadrian’s Wall. The traditional concentration on structures and their military aspects has obscured the archaeological potential of this frontier zone and the complex relationship between an imperial state and local tribal groups. Some have seen the wall as a way to control movements and communications in a largely peaceful environment – a type of customs barrier - while others have emphasised the defensive function due to a genuine military threat. The brief mention in the classical sources that Hadrian ‘was the first to construct a wall, eighty miles in length, which was to separate the barbarians from the Romans’  has been and still is the subject of much debate. Matthew set the scene by showing an atmospheric reconstruction painting (by Alan Sorrell) of a fort on the wall and mentioned modern structures such as The Berlin Wall for comparative purposes. The wall was originally planned to be 76 Roman miles running from Newcastle to Bownesson-Solway on the Cumbrian coast and constructed to take advantage of the higher ground to the north of the Stanegate – a road which linked the Tyne and the Solway. The wall was later extended to Wallsend on the east to make a length of 80 Roman miles. Hadrian’s Wall may have been ordered by the emperor when he visited the province in AD122 as a response to some major unrest among British tribes c117 AD and it appears that the original plan was to have a wall of stone or turf fronted by a wide and deep ditch with 80 milecastles – a mile apart (in theory) each containing a small group of soldiers. Between each milecastle were 2 evenly spaced small turrets which were watchtowers – lookout posts which could also be used for signalling. But due to the nature of the terrain some structures were placed at more suitable positions. A number of extra forts on the line of the Wall itself were a late addition to the original plan. The wall took at least six years to complete and was built in sections by legionaries but once built was manned by auxiliary units from all over the Empire. Each fort housed a single auxiliary unit with infantry or cavalry soldiers, or both. There has been much debate about the purpose of the wall and it is now generally agreed that it acted both as a visible demonstration of Roman power and influence, even more so if, as has been suggested, it was plastered and whitewashed. While the wall did mark a Roman frontier (extended to the north later with the Antonine Wall) it was also to make security checks, controlling the passage of people and goods and where taxes / dues could be collected. A deep ditch known as the vallum to the south was added, still visible in sections today. There is more research to be done on understanding the turf sector at the western end, so too the vallum as well as the civic settlements, Mithraeum and cemeteries which have been revealed by geophysical surveys which will add to our knowledge. So too will further studies on the time after Hadrian as well as on material remains like the “Staffordshire moorlands pan” which names the Wall, as well as inscriptions and writing tablets. In addition, new planning regulations have revealed unknown roads, villas and rural settlements including evidence of roundhouses north of Newcastle allowing further study on the impact of the frontier on the local population, which will add to our knowledge of this important monument. Prof Caroline Barron will be speaking on Women in Medieval London for HADAS and not Doctor Caroline Cartwright as listed in the August newsletter. Many members of the society will know of the resistivity meter which the society uses with great success. This was provided by the Council for Independent Archaeology, which set out to produce a resistivity meter which would be affordable for local societies. Over 100 were produced, but unfortunately production then had to cease due to an EU directive forbidding lead soldering – which was very necessary in producing the actual meter. However Bob Randall, the electronics wizard who produced the meter, has now produced a Mark 2 which is a great upgrade of the whole meter. This features a computer tablet – it will work with any Android tablet – which is attached to the meter and will record the results of the survey as the survey proceeds. This means that the area of the survey can be adapted according to the results. 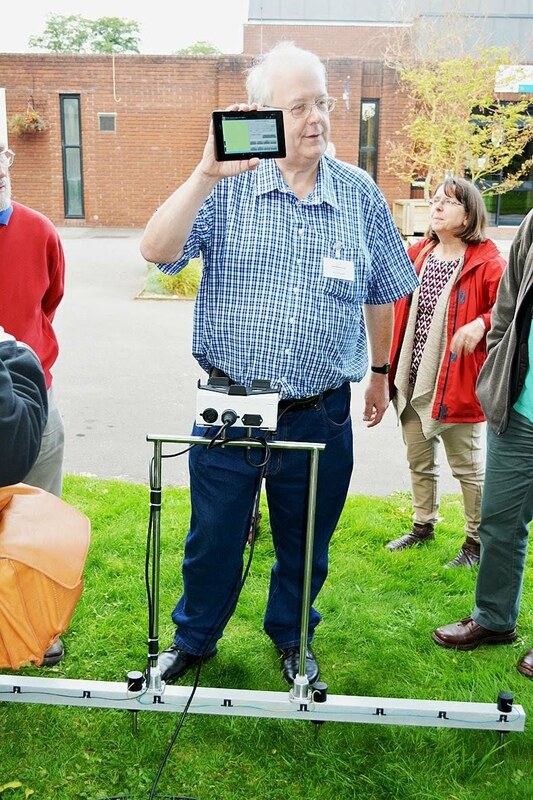 The meter will receive its first public demonstration at the annual conference of the Council for Independent Archaeology, which will be held at Toddington (Dunstable) – on the 24th September 2016. The venue is in fact at a pioneering venue, the Poplar’s Garden Centre, which is just off the M1 at the Toddington turn-off. They have just added an education centre to their facilities which the CIA is hiring for the day. It should be easily accessible to HADAS members – it is only half a mile off the M1. A feature of the conference will be the work of the local society. The conference will be held in conjunction with the Ampthill and District Archaeological and Historical Society and will feature the excavations at Ampthill Castle where the society did an extensive geophysical survey in advance of the professional-led excavations — which proved to be something of a fiasco. We will be visiting the site of the excavations as an add-on to the conference on Sunday, 25 September. Details of the conference can be seen on the CIA website at www.independents.org.uk . Email Keith Foster on skfoster@btinternet.com to make a booking. Saturday 17th September. Barnet Museum and Local History Society. Coach outing to Rochester. For details please contact Dennis Bird at 87 Hadley Highstone, Barnet, EN5 4QQ. Telephone 0208 449 0705 or Barnet Museum on 020 8440 8066. Email: enquiries@barnetmuseum.org.uk. Cost £16. Tuesday 4th October, 7.30pm. Enfield Society. Jubilee Hall, 2 Parsonage Lane, Enfield, EN2 0AJ. Preserving Enfield, cultivated residents. Talk by Joe Studman. £3. Monday 10th October, 1pm. Gresham College at Museum of London, 150 London Wall, EC2Y 5HN. This and the next 3 Gresham talks are FREE. The early river Thames: The Iron Age and before by Jon Cotton. Friday 14th October, 7.45pm. Enfield Archaeology Society. Jubilee Hall, 2 Parsonage Lane, Enfield, EN2 0AJ. Verulamium revealed, Kris Lookyear. Friday 14th October to Sunday the 16th of October. Conference at Royal armouries at the Tower of London, 1066: interpreting the Norman Conquest. Contact bookings at bookings@armouries.org.uk or tel. 0113 230 1888. Monday 17th October, 1pm. Gresham College at Museum of London. The growth of London as a port from Roman to Medieval times. Gustav Milne. Wednesday 19th October, 7.30pm. Willesden Local History Society. St Mary’s Church Hall, Neasden lane, NW10 2TS. Clitterhouse Farm. Roger Chapman (HADAS) on the latest information. Friday 21st October, 7pm. COLAS. St Olave’s Parish Hall, Mark Lane, EC2R 7LQ. Quarrying and selective deposition in Roman Ewell. Alexis Haslam (P.C.A) Visitors £2. Friday 21st October, 7.30pm. Wembley History Society, English Martyrs Hall, Chalkhill Rd, Wembley HA9 9EW (top of Blackbird Hill). Cutting edge. Lester Hillman on the 200th anniversary of the opening of the Regents Canal. Visitors £3. Refreshments 50p. Monday 24th October, 1pm. Gresham College at Museum of London. From sail to steam: London’s role in a shipbuilding revolution. Elliott Wragg. Wednesday 26th October, 7.45pm. Friern Barney and District Local History Society. North Middx Golf Club, the Manor House, Friern Barnet Lane, N20 OWL. Queens of Henry the VIII. Gary Fisher. Visitors £2. Thursday 27th October, 8pm. Finchley Society. Drawing room, Avenue House, East End Road, N3 3QE.Discussion meeting. For further details please see their Sept/Oct Newsletter. Visitors £2. Monday 31st October, 1pm. Gresham College at Museum of London. The port of London and its future. Doctor Riggs.